The increased use of polymer matrix composites in structural applications has led to the growing need for a very high level of quality control and testing of products to ensure and monitor performance over time. Non-destructive evaluation (NDE) of polymer matrix composites explores a range of NDE techniques and the use of these techniques in a variety of application areas. Part one provides an overview of a range of NDE and NDT techniques including eddy current testing, shearography, ultrasonics, acoustic emission, and dielectrics. Part two highlights the use of NDE techniques for adhesively bonded applications. Part three focuses on NDE techniques for aerospace applications including the evaluation of aerospace composites for impact damage and flaw characterisation. Finally, the use of traditional and emerging NDE techniques in civil and marine applications is explored in part four. 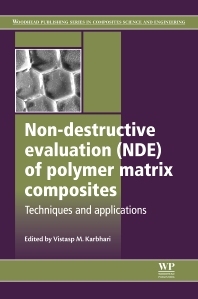 With its distinguished editor and international team of expert contributors, Non-destructive evaluation (NDE) of polymer matrix composites is a technical resource for researchers and engineers using polymer matrix composites, professionals requiring an understanding of non-destructive evaluation techniques, and academics interested in this field. Materials testing practitioners in industry: predominantly aerospace in both military and commercial sectors such as the transport and aerospace industries, mechanical and civil engineering and architecture; Researchers, academics and graduate/post graduate students in aeronautical/mechanical/electrical engineering and materials science.